The automat is due for a comeback. Cakes and pies on demand, people! 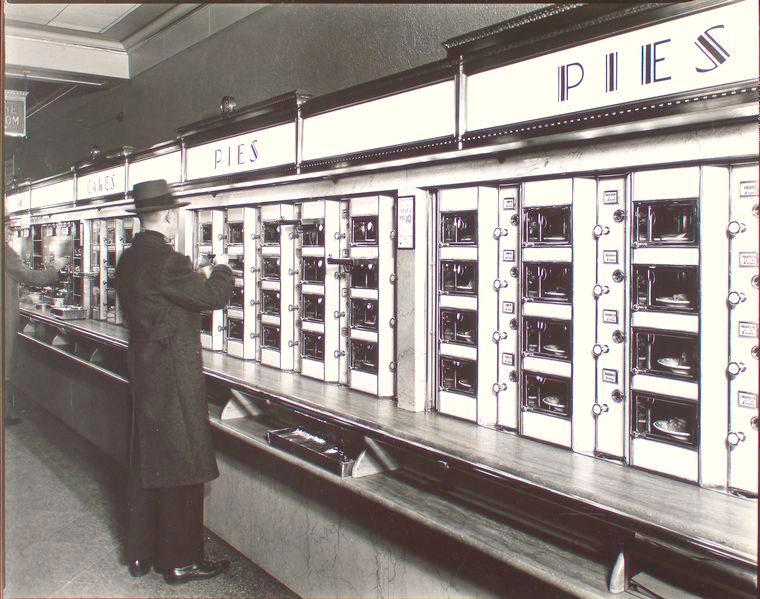 Utterly fascinated by this photo titled “Automat” by Berenice Abbott, 1936 via Wikipedia. According to Decide Your Side, Obama and Romney supporters do have one thing in common: they both prefer cake to pie by a 3-point margin. That’s right, we’re just 3 weeks out from the ultimate pie holiday, and the American people have spoken! I wasn’t sure what to expect from the Irish Inn at Glen Echo, which I’ve been meaning to try forever. But when my shepherd’s pie came out in its own tiny copper pot, meticulously prepared and perfectly seasoned, I figured this was more than a few notches above your usual pub fare. That definitely held true for the banoffee pie. The way this dessert was presented was something you’d expect from a much fancier joint, not a place that serves up bangers and mash. 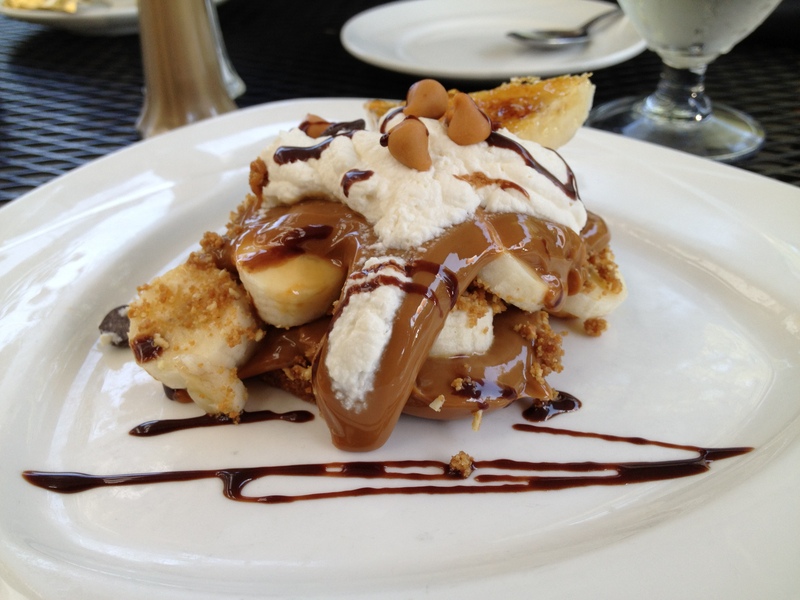 This particular take on the traditional English dessert (a richer version of American banana cream pie) was deconstructed: an oozing pile of bananas, cookie crumble, and toffee generously layered on top of each other. Without a true base crust to ground it, this banoffee “pie” felt overly rich. Almost like I was shoveling caramel sauce from the jar into my mouth. I would’ve liked more crunch to balance the softer textures. All said, though, we did clean the plate. First there was the cherpumple. Now there’s the (not as over-the-top) strawberry pie cake, offering something to please everyone, no matter what side they’re on. It’s a pie! It’s a cake! 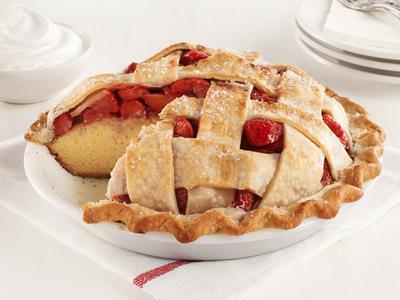 The recipe looks relatively easy–you use store-bought cake mix and pie dough. I haven’t attempted this yet, but it would be good for a party with some fresh whipped cream and maybe a layer of strawberry jam between the cake and berries. Brûléed bananas and pineapple slices accompany this king among pies from Black Salt. A good pie is hard to find. I’m not talking about a just-satisfactory pie. I’m talking about a pie that makes you swoon—the perfect proportion of filling to crust, sweet to salty, soft to crunchy. This coconut-banana cream pie’s from Black Salt, and everything about it is pretty über. The chef exercises restraint with the sugar. The crust is super thick. And the accompaniments all bring something to the party–if you share, you might be fighting over the brûléed bananas with the crunchy tops. While I bristle at any dessert that costs $11, this was a damn good pie, as Agent Cooper would say (if only he could get his hands on it). 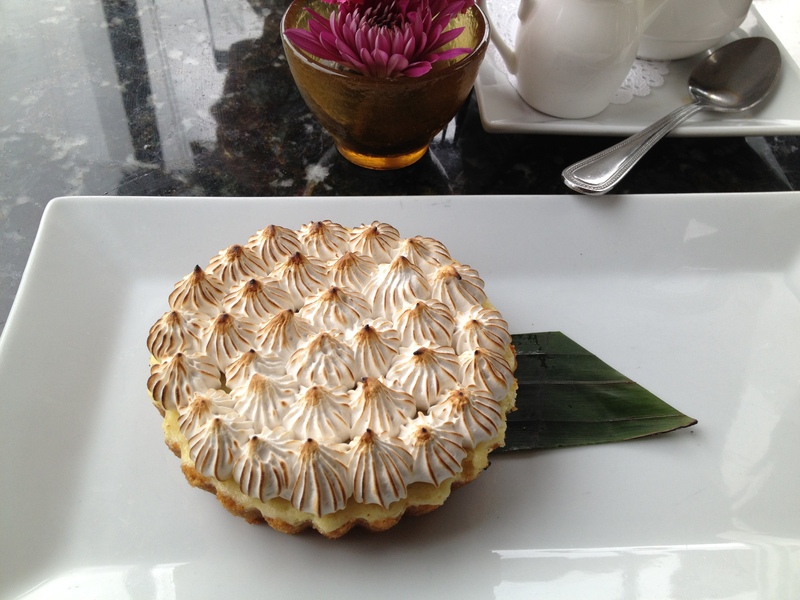 Almost as good as the Ritz Seafood coconut cream pie. But a lot closer to home. 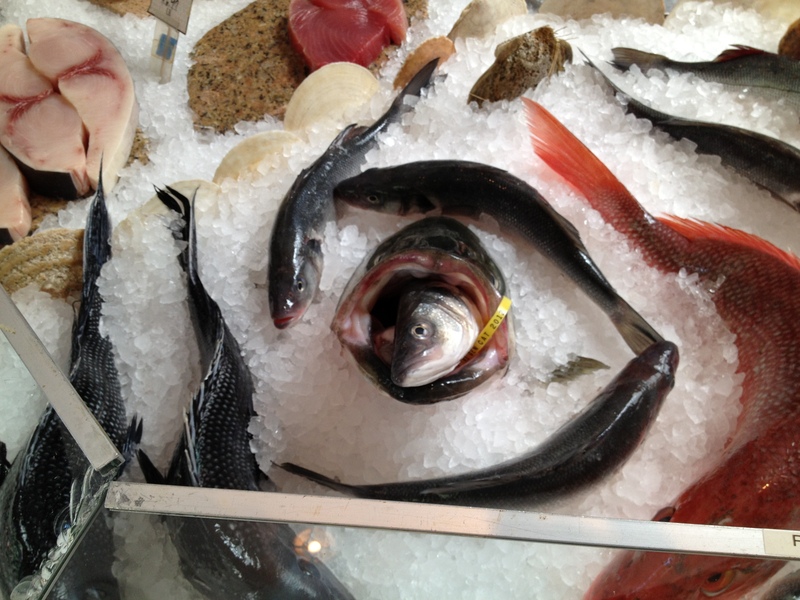 While the fishmongers get points for creativity, this tableau doesn’t exactly put me in the mood for brunch. Aside: To get to the restaurant section of Black Salt, you have to walk through their fish market. We’re not talking Asian-grocery-store-seafood-department emanations,* but it’s pretty darn pungent. Good thing the main dining area is far away enough that you can enjoy your meal without those olfactory distractions. *I’m Asian, so I’m allowed to say this. Sometimes you gotta venture out of your comfort zone to try new things. For a belated birthday brunch, I recently took Mr. X-sXe to Maple Avenue Restaurant in Vienna, VA—that exotic state where you can still get plastic grocery bags for free. The dining space is tiny, probably less than 10 tables with no separate foyer/entrance area. We went for the brunch tasting menu. The food was consistently good: a gooey mac and cheese with panko, a savory mushroom crepe, cauliflower with Thai sauce and a sprinkling of scallions. But there were a few hints that the menu needed more thought. And now we turn to the most important part of the meal: dessert. Wow, right? This was beautiful—its marshmallow peaks perfectly torched, blanketing the citrusy filling on a thick graham crust. Perhaps this wasn’t the chef’s intent, but anytime I see “lime” on a dessert menu, I’m hoping for some mouth-puckering action. Here the sweetness of the marshmallow fluff actually overwhelmed the delicate flavor of the yuzu-lime filling. Note: we ordered this separately from the tasting menu. Sure, this elevates the waffles you’d get at the breakfast bar of a Comfort Inn. But is it good enough to warrant being on the menu of a nice restaurant? I’m leaning towards no. I was curious whether the Nutella was from the jar or made in-house. The menu didn’t elaborate on this point, but it tasted like the jar stuff (which is NOT health food, despite what the ads claim. Hence the class-action lawsuit. #onlyinAmerica).